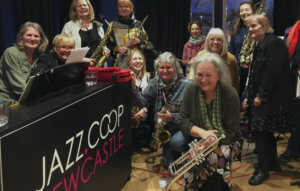 Jazz workshops specifically for women led by inspirational tutor Jilly Jarman. The workshops create a supportive atmosphere for instrumentalists and vocalists alike. They concentrate on developing ways to improvise, playing with others, and having fun with jazz repertoire and beyond. Playing is usually done by ear though help from sheet music will be available too. Learning will include: communicating with other musicians, demystifying jargon and preparing for a jam session. Workshops will be held on Saturday afternoons, 2pm – 5pm, on the following dates. Each one will be different and complete. You are welcome to come to one, some or all of them. Suitable for female instrumentalists and vocalists, aged 16 to infinity. The standard fee is £28 per workshop, and there is a discounted rate of £25 for Jazz.Coop members. You get a 10% discount if you book for all four workshops. Please complete the form below. You need to pay for the workshops in advance. How have you paid for the workshops?